Rare Dated Oval Enameled Pearlware Plaque, 1795, reverse with hand painted inscription “Model’d (sic) in the year 1795 by J Williams & Colour’d (sic) by H. Clarke.” 6 ½”. 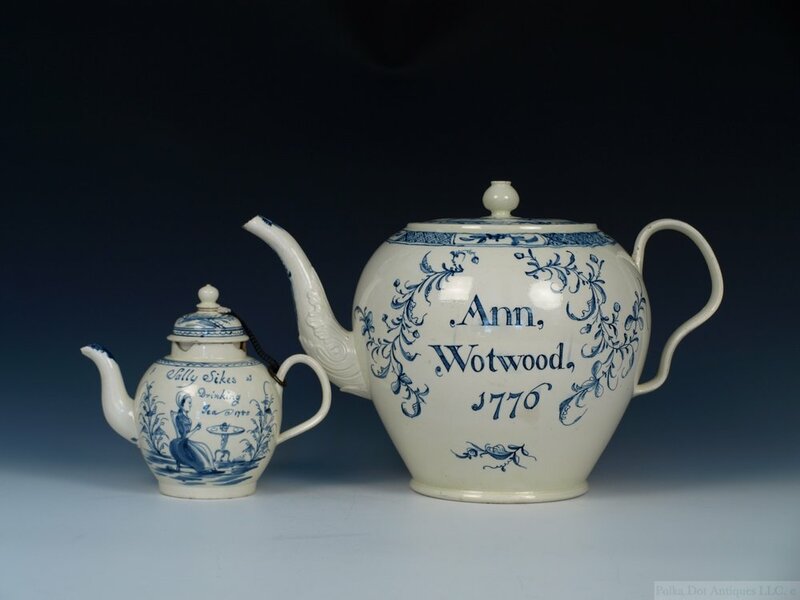 English Creamware Blue and White Named and Dated Punch Pot, 1776, painted name “Ann Wotwood, 1776,” 10¼” high. Unique Hand Drawn Plan - The Estate of Thomas Whieldon, Esq, dated 1794, 18¼” Sq. Staffordshire Creamware Dated Teapot, “Sally Sikes Drinking Tea, 1780, 6¾“ high. 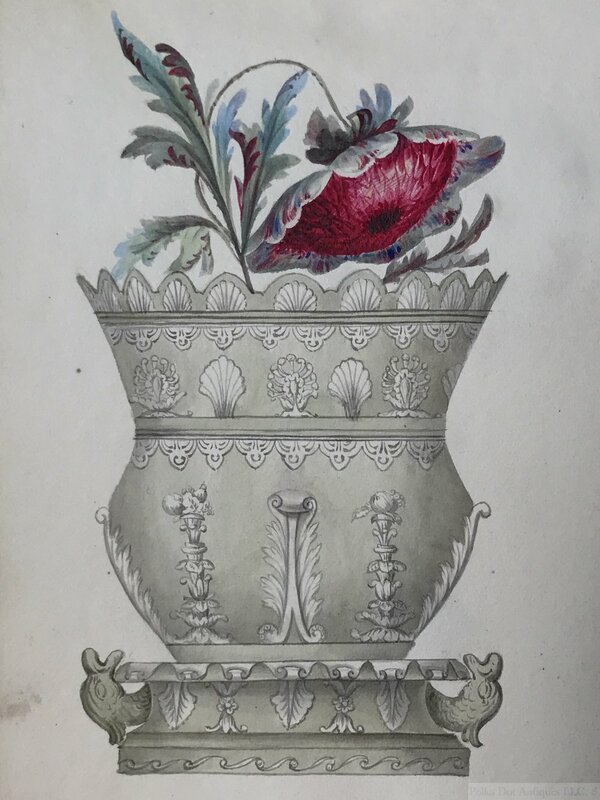 Furnivals Pattern Book, 1890-1930s, and vase. 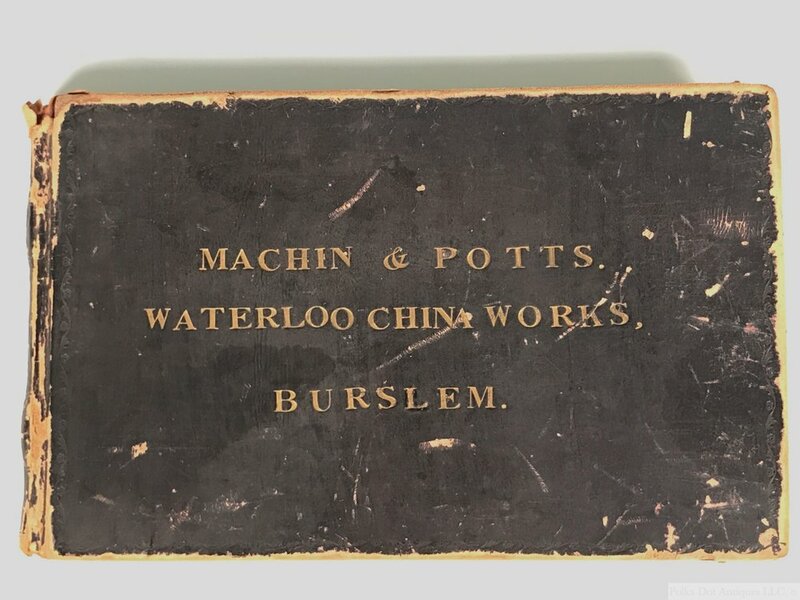 Machin & Potts, Waterloo China Works. Burslem, Shape Book, 1830s, comprising 52 designs. Staffordshire Pearlware Group of a Savoyard and Dancing Bear, c.1820, 8½“. Staffordshire Pratt Ware Figure of Autumn, c.1790, 7¾“. Staffordshire Pratt Ware Figure of a Sportsman, c.1790, 10½“. Rare Ralph Wood-type Figure of a Reclining Deer, c.1780. 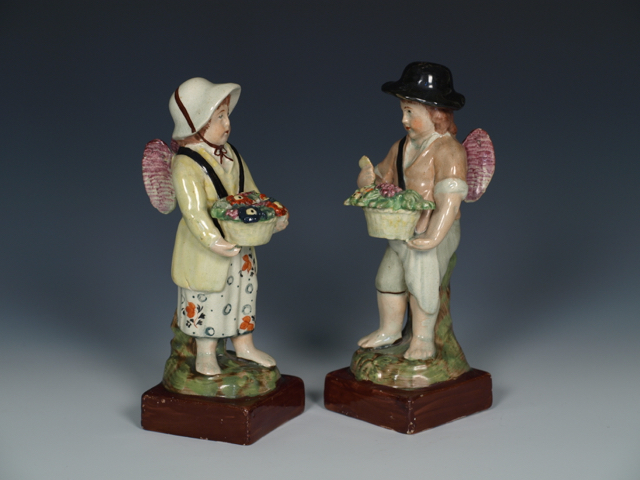 Pair of Staffordshire Pearlware figures of Cupids Disguised as Vendors, c.1810, 7”. Pair of Locke & Co Worcester Pâte-sur-Pâte Door Knobs, c.1895-1900. Doulton Lambeth Salt Glazed Stoneware Jug, 1891-1902, 9¼“ high. 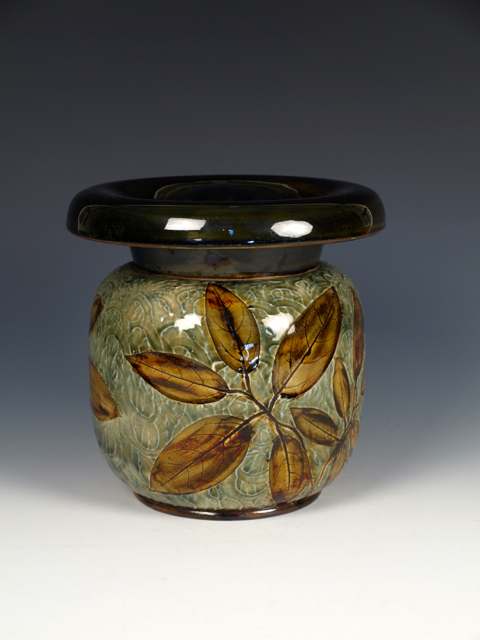 Doulton Lambeth Stoneware Vase by Hannah B. Barlow, 1891-1902, 9¼“ high. Moorcroft ‘Moonlit Blue’ Vase, 1918-1929, 5¾”. Martin Brothers Stoneware Vase, 1897-1893, (remains of London showroom paper label 16, Brownlow St), 9½“ high. 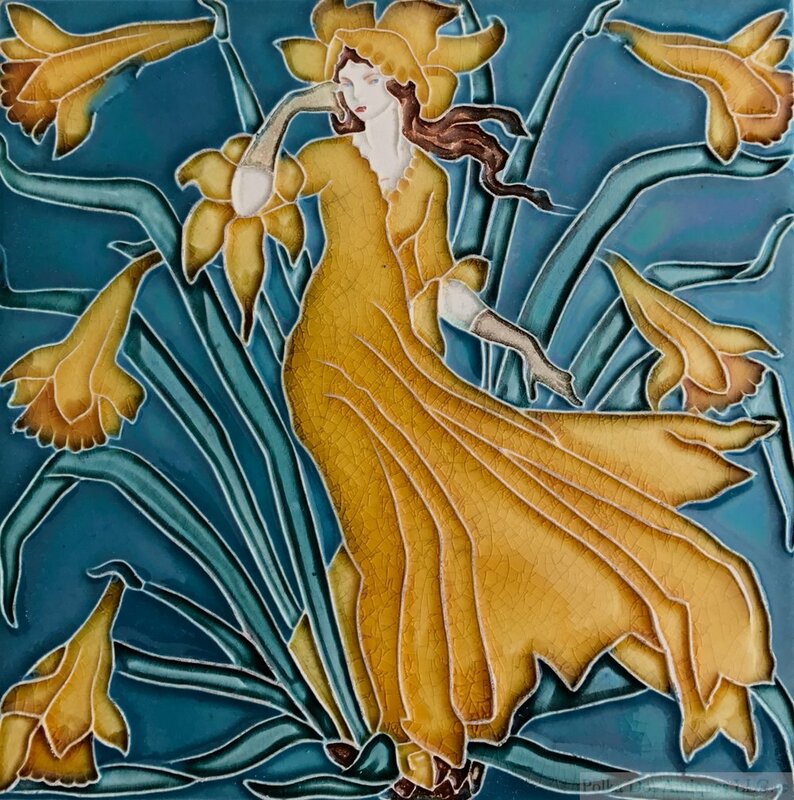 Pilkington Royal Lancastrian Pottery Tile “Daffodil” Designed by Walter Crane, 1900 – 1901, 6” x 6”. Pair of Wedgwood Aesthetic Movement Outside Decorated Plaques, “Romeo” & “Juliet”, 1881, by J. R. Hewitt, 15”. Moorcroft Liberty Tudric ‘Poppies’ Tazza, 1913, 4½" diam, 2½“ high. Pair of Doulton Lambeth Salt-Glazed Stoneware Vases, 1875, by Eliza Simmance, 4¾“ (12.5 cm). Wemyss Pin Dish, c.1900, hand painted with cabbage roses, “No Rose without a Thorn”, 5¾“. Rare Lois Whitcomb Rhead Pâte-sur-pâte Framed Plaque ‘The Scimeter’, 1920-22, , 4” diam. Doulton Lambeth Salt Glazed Stoneware ‘Natural Foliage Ware’ Cuspidor, 1902-1922, made for a Boston retailer, J. McD & S Co.
Mintons Majolica Lion, 1890–1910, 8”. Rare Staffordshire Pearlware Group 'The Death of Munrow,’ c.1820-30, 14½“ length. Staffordshire Agate Ware Pecten Shell Teapot and Cover, 1750s, 5½“ (14 cm) high. Creamware Jug “The Town & Trade of Shrewsbury for Ever”, 1807, 7 1/8” high. Together with a contemporary rectangular copper engraving plate. English Tin-Glazed Earthenware Footed Dish, 1710/20, possibly London, 5 3/8th”. Rare Staffordshire Solid Agate Ware Cow Creamer, c.1775. Provenance – Captain C. B. Kidd Collection. Sotheby’s, London, 10/1/67. Lot - 37. Christie’s, London, 1/6/70. Lot – 95. Boswell and Ward. Stoneware Solid Agate Model of a Cat, c.1750, 4 ½”. Staffordshire Creamware Cow Creamer & Cover, c.1790. Flight, Barr & Barr Armorial Part Dessert Service, 1820-30, with the crest and arms of the Perkins and Sanders family. 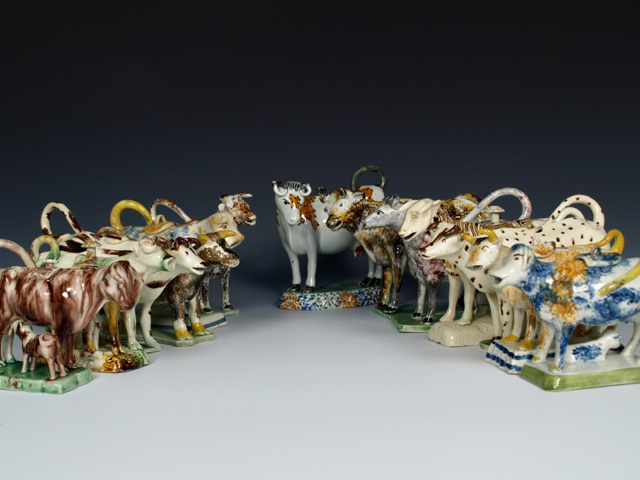 Collection of Staffordshire Pearlware Cow Creamers. Staffordshire Creamware Satyr Mask Wall Pocket, 1770/80s, 8½”. English Delftware Kylin Dish, 1750-60, probably Liverpool or Bristol, 11¾“. 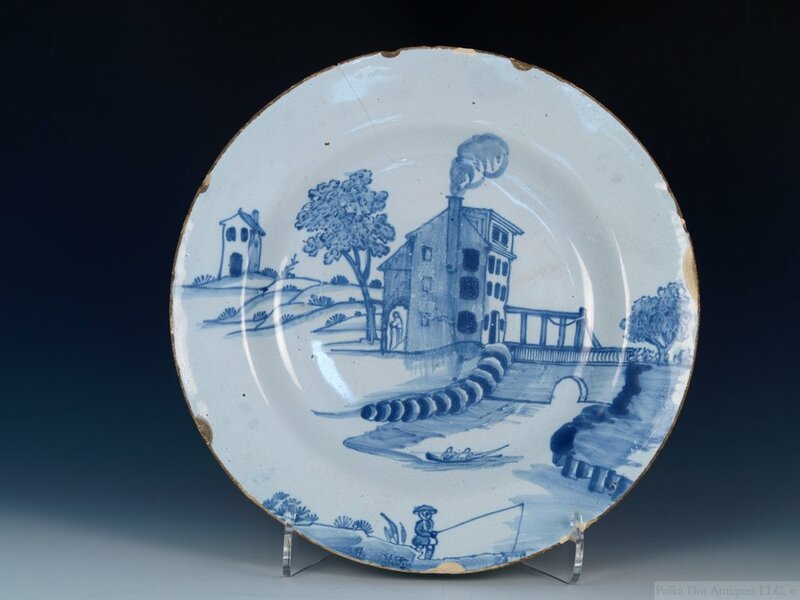 English Delftware Charger, 1750/70, 12¼“. English Delftware Polychrome Chinoiserie Plate, Bristol, 1730-40, painted in red, blue yellow and green, 6¾“. Two Royal Worcester Parian ‘Aesthetic Movement’ Teapots, 1882/4, designed byR. W. Binns modeled by James Hadley, 'FEARFUL CONSEQUENCES - THROUGH THE LAWS OF NATURAL SELECTION AND EVOLUTION OF LIVING UP TO ONE'S TEAPOT', 6¼“ high. Very Rare Staffordshire Salt-Glazed Three Color Printed Plate, 1756-60, 9 1/8“. EnglishDelftware Adam and Eve Blue Dash Charger, 1690 - 1710, possibly Lambeth, 13 1/8 “ diam. Liverpool Delftware ‘Fazackerly’ Charger, c.1760, 13¼" diam. Liverpool Delftware ‘Fazackerly’ Charger, c.1760, 13¼" diamond. 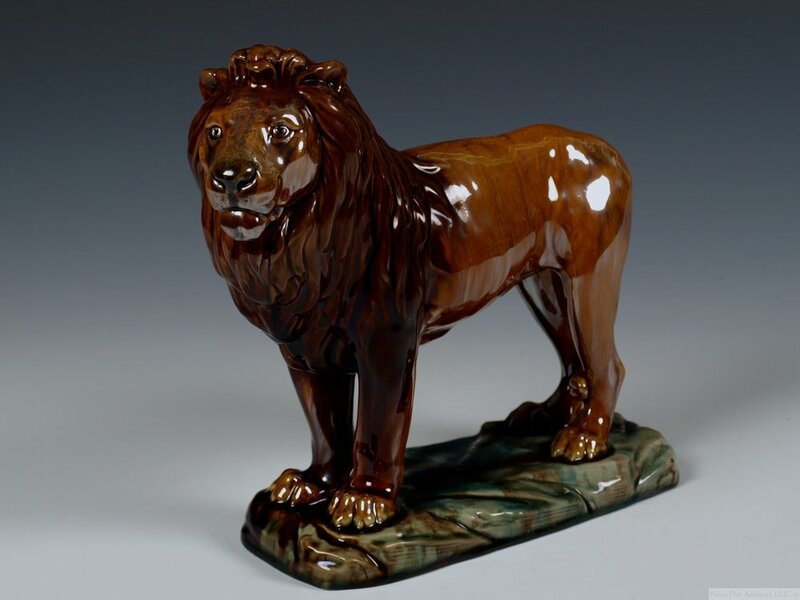 Stafordshire pottery figure of a Lion, c.1810-20, 9” high by 12"
Set of Four Dixon Austin & Co Figures of the Seasons, c.1820, 9”. Set of Four Dixon Austin & Co Figures of the Seasons, c.1820, on stiff leaf bases with acanthus corners, 9”. Staffordshire Whieldon-type Creamware Tea Caddy, c.1760, 4¼“. Staffordshire Whieldon-type Rectangular Tea Caddy, c.1760, 3¾”. Pearlware Fox and Swan Sauceboat, c.1780s. 6” long. 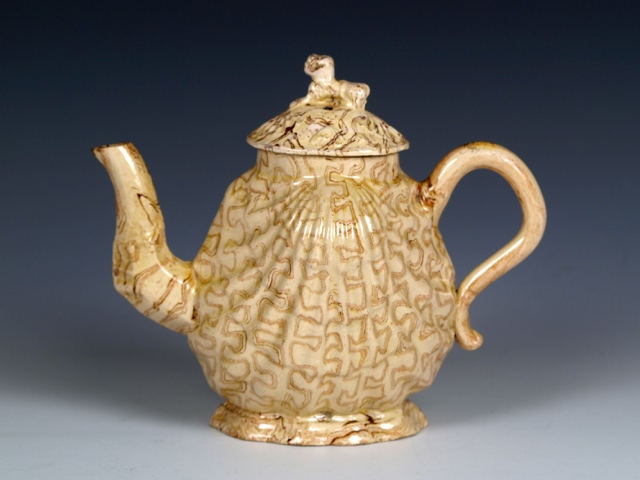 Staffordshire Whieldon-type Creamware Small Teapot and Cover, c.1770, 3 5/8” high. A Small Spode Blue & White Oval Dish, 1840s, 9¼ x 6½”. Rare Miniature Pratt Ware Rabbit Ware, c.1790, in low-relief in brown and green, 2¾”. A Staffordshire Pearlware Cow Creamer, c.1800, sponged in ochre and manganese, lacking cover. 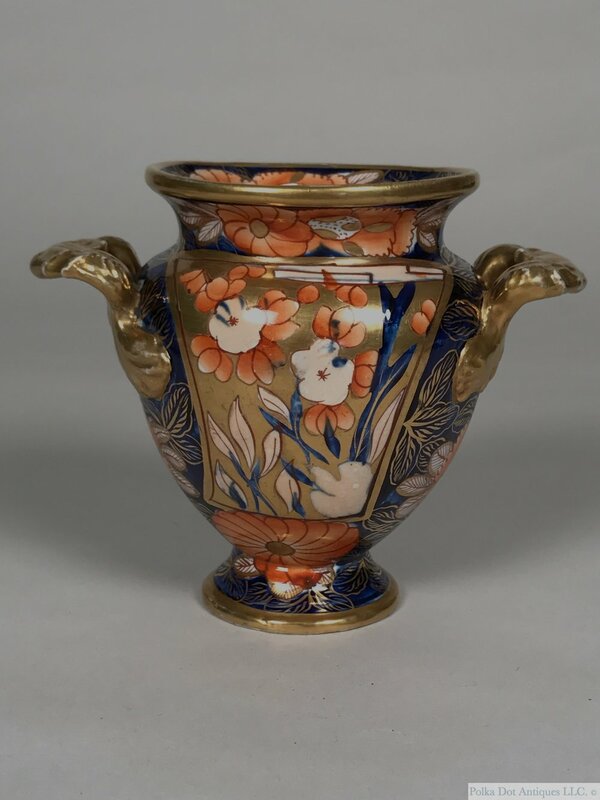 Mason’s Ironstone School House Pattern Two Handled Vase, circa 1820, 5”.